Hi! I may have asked this before, if so, I apologize. I know nothing about video software, but I did a lot of doodling in my art book while listening to performances at E-M. The music inspired me to do weird space art. If I do a performance next year I'd like to include some of this art as video backgrounds, a kind of slide show that includes effects like fading one page into the next, color changes etc. What's the best way to do this? I thought about powerpoint, but that doesn't offer enough effects. I imagine that I'd have to burn the result onto a DVD and submit it. I have a PC with windows 7, I also have a MacBook. If anyone can recommend some simple software...? I also have a MacBook. Another option is to contact one of the video artists who might be doing the visuals for your set. You can send them the stills and they can be incorporated into the visuals. I did this for Symmetry this year. Nice artwork, by the way! If your macbook has iPhoto, that will definitely let you create a video of a slideshow. It has a variety of transition options, but won't let you do anything with the color. I'm using iLife '09, iPhoto v8. A new iLife just came out but I don't have it, I don't know if the slideshow function changed/improved. Thanks! I'd love to be able to do 'transitions' that fade from one slide to the next... sort of like what Hong was doing with your video equip. back in 09. Is there any software that can do that? Sort of like Photoshop layers with slides. So, to give images to a visual artist, what would be the format for the images? Like dimensions, pixel sizes etc. 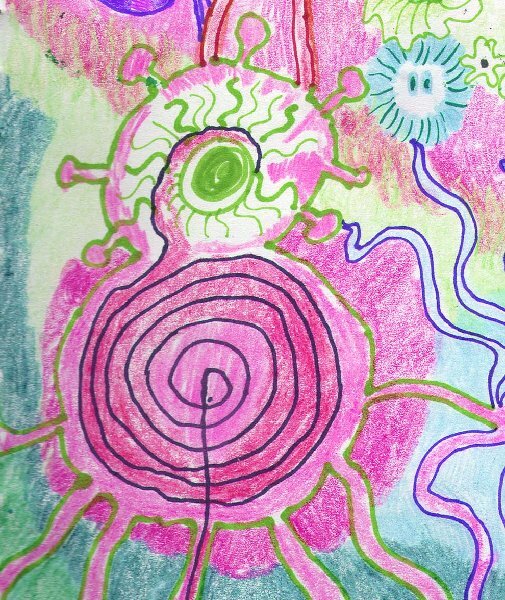 I'm working on a collection of psychedelic art jpgs, mostly like 3x3 inches give or take. would I have to alter these or just put them all on a CD and give it to a visual artist? Most visual artists can resize them to suit their needs. But if you want to avoid stretching, you should use the same aspect ratio as the projector/screen. It's most important for images of people or circular objects, etc. Many abstract images can be stretched without being noticeable. Typical aspect ratio is 4:3, e.g. 640x480 pixels. If you're connecting your computer directly to the projector (not through a video mixer) you can use a higher resolution like 1024x768. Some people use a wide screen format such as 16:9 or 3:2. Use square pixels if you plan to show the images on a computer. Images captured on a video camera have rectangular pixels, so if you have frame captures you'll need to resize them. If you want to make a DVD, your video editing software should convert the square pixels to rectangular. One more thing... If you're scanning in your artwork, use the highest resolution you can work with on your computer. Do your processing and image manipulation on that version to maintain the best quality. Keep the originals around for future use. If the resolution is high, you can crop small parts out of them, it's almost like getting new artwork. Don't resize to 640x480 (or whatever) until you're prepping your show. thanks, I have been looking thru these but they are all about importing movies/videos, I can't find one that lets you import jpg images. >One more thing... If you're scanning in your artwork, use the highest resolution you can work with on your computer. what image size and dpi would you suggest? you mean like 600 dpi? I'm scanning these & colorizing in photoshop. Most of my art pages are like 4x3 because that's the dimensions of my drawing book. But I have been saving them as "screen resolution"...probably jpgs with 76 dpi. >Don't resize to 640x480 (or whatever) until you're prepping your show. 640X480 for the finished designs? Thanks, that's helpful. You're saying if I create a collection of art images & burn them onto a CD, a person with a VJ device could create a show with them, add transitions etc? Any VJ software should let you process still images as well as video clips. Start with the highest resolution your scanner supports. But you may find the files are too big to work with in photoshop or to save on your computer (if you have a lot of them). If you save as jpg, use the highest quality setting. I have been resizing my images as 4X3, but they appear to be 300 dpi resolution, is that too small? What is the usual procedure for showing a video, is it burned onto a DVD and then shown thru a projector? My son says it would be better to download a Mac version of Visual Jockey and show my video via my MacBook. Which I suppose would then be connected to a projector? See, I know absolutely nothing about this medium, once again I have ventured into completely unfamiliar territory, just like electronic music was a few years ago. I must be nuts!! 300 dpi is probably fine, it depends on the size of the image you are trying to scan. dpi is really only a measure of resolution for a printed image. Once it's on the computer, resolution is measured in pixels. If you will be connecting your computer directly to the projector, you can use a higher resolution like 1024 x 768. However, if you're processing the visuals in real time (adding effects), your computer might be slower than you like for images of this size. If you're burning to DVD, the effective resolution is 640x480 (for 4:3 NTSC), so there's no need to have anything higher for the final clips or photos. That also applies if you're mixing or processing the video in the analog domain, or if you want to use composite video or s-video cables to go longer distances to the projector (long VGA cables can be expensive). However, if you are working with images in e.g. photoshop, you want to have higher resolution for the original images, to retain as much quality as possible as you process them. Just as you might want to record your music at higher than 16 bits, even though you may ultimately mix down to a CD at 16 bits. The decision about whether to burn a DVD or just transmit the visuals from your computer has to do with 1) Do you want to control things in real time or just play a pre-recorded visual? 2) How much gear to you want to bring to the gig, and 3) Can you live with the somewhat lower quality of the DVD, based on the types of images you have. Yep, just a pre-recorded visual, I really want to keep it simple. In 2009 I recall that musicians playing a set could just give Hong a DVD to play for the visuals. Or was it "a CD with images". Not sure. So I would rather just bring a disc. How does the image quality projected onto a screen compare with how it looks on the computer monitor? laura - i suggested you checkout iphoto.. i've been messing with imovie the last few days and it is worth checking out as well. Hope everyone on the forum is well! I recently moved so my creative projects were set back a few months. I have been experimenting with Video Jockey. I got to where I can create 10 min. .avi movies that are 480 X 360 and in the 200 mb range. I think. If I burn avi's onto a DVD, will they work as movies, or is there further conversion required? Once they are on a DVD, what kind of viewing equipment will there be at E-M? Is there a computer that is connected to a projector?? Do people bring their own laptops? Does the laptop need a special video card? Sorry for the way too many dumb questions! A video DVD is different from a data DVD with video (avi) files on it, just like an audio CD is different from a data CD with wav files on it. You'll need special software to create a video DVD, there are plenty of options. The software will take care of the encoding and compression in the proper format. A video DVD should play on any DVD player. If you only have video files, you can play them from a laptop with media player software, or with VJ software if you want to manipulate them as they are playing. For "standard video" quality, your source files should be 640x480. At em2011, there will be projectors set up in each room, probably also computers, DVD players, and mixers. Best bet is to bring a video DVD, or a laptop with your video files on it and software to play them. If you can't do either of those, contact the artist who will be doing your visuals to be sure they have a way to play your video files. (visual artists will most likely be assigned to musical performances in JUly or August). If you have access to a computer running Linux, Cinelerra might be useful to you. With Cinelerra and ffmpeg, you can put in any format and get out any format, any size, resolution, frame rate, etc. Cinelerra has a small but nifty collection of plugins, too. You can probably find more, but I haven't gotten that far yet. The best part is, it's all free! If you don't have a Linux machine, you could create a virtual machine on an existing Windows computer, or if you're feeling more adventurous, put some hard disk space aside for a dual-boot. You might find it worthwhile, as there are TONS of free multimedia tools of all kinds for Linux.